With summer now in full swing, it is time to start getting ready for all of the fun BBQs and other events that we are planning. Of course one of the biggest events of the summer is always celebrating the 4th of July with a delicious BBQ before getting together to watch fireworks. In order to have a great BBQ, it is important to have great food! 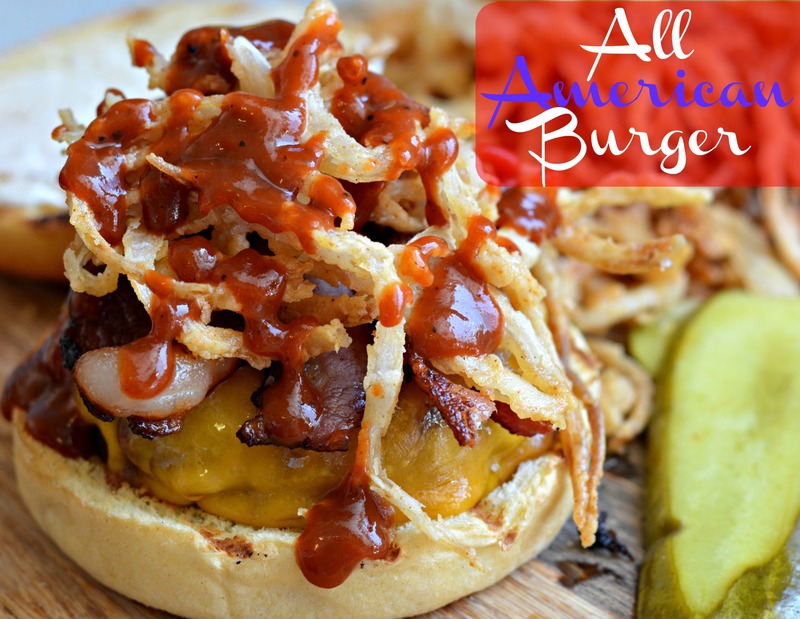 That is why this year, in honor of it being the American Independence Day, I am going to share a recipe for a delicious, all-American burger that will be a hit at any 4th of July BBQ this year. We moved to the house that we currently live in about a year and half ago, and one of the things I love about it is the backyard. Our house is located on an elevated part of the neighborhood, so we can see out over the houses that are behind us. This is great when the 4th of July comes around, because there is a park in our town where they put on a great fireworks show, and because of where our house is located, we can put out some chairs on our patio and see the fireworks perfectly! 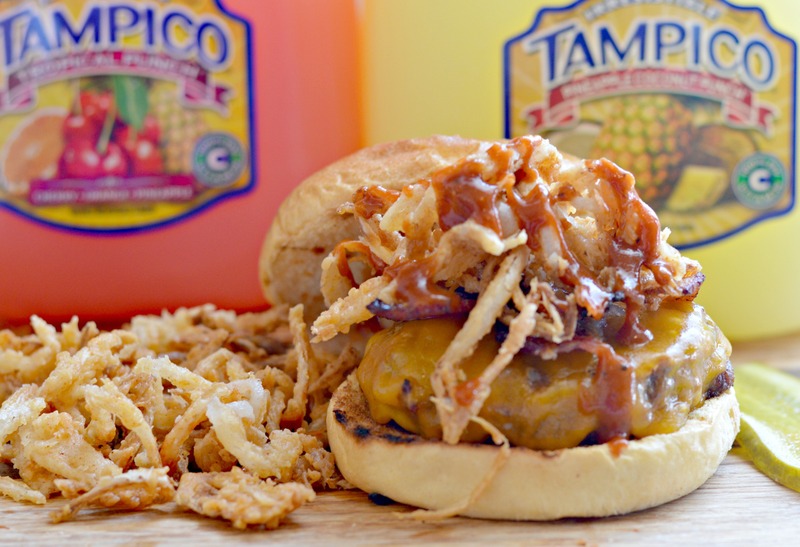 We love Tampico in our family and it is great for a BBQ. My husband lived in Bolivia for two years, and he always tells me about how he always had Tampico on hand to drink at night or at any time. He has never been a big fan of soda, and the water at times would make him sick, so Tampico was a go-to for him and every time that we get a chance to drink it now it reminds him of the great experience that he had in Bolivia. I used to drink it a lot in Mexico too, so I love including it whenever I can too! 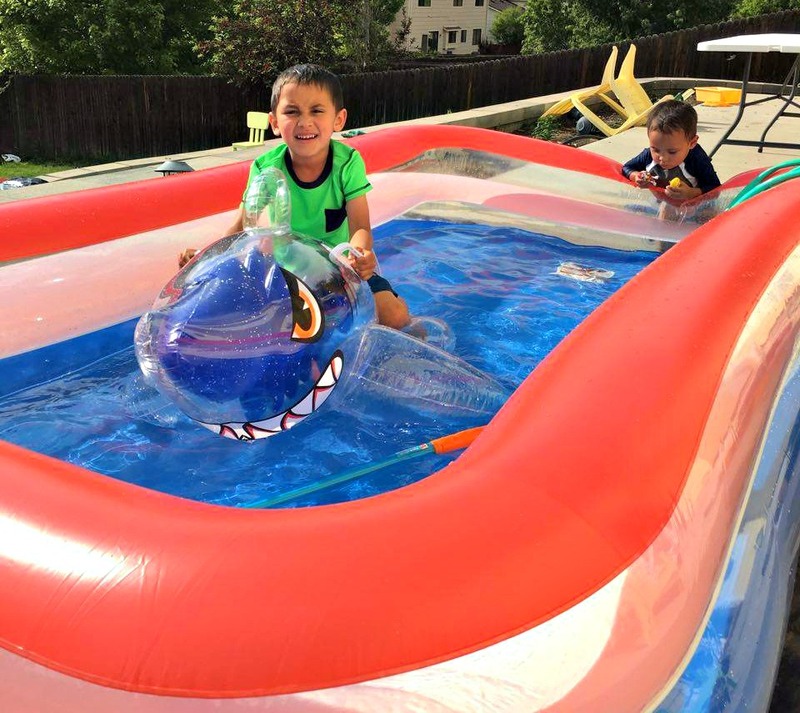 To make sure that our kids have fun on the 4th of July while waiting for the fireworks, we planned a couple of fun activities that they can do on our patio. First, we bought this great red and blue inflatable swimming pool. They love being able to go into the backyard to play in their pool – especially on these hot summer days. They had a great time playing in the pool when we filled it up the other day, so I am confident that they will enjoy it just as much on the 4th of July. 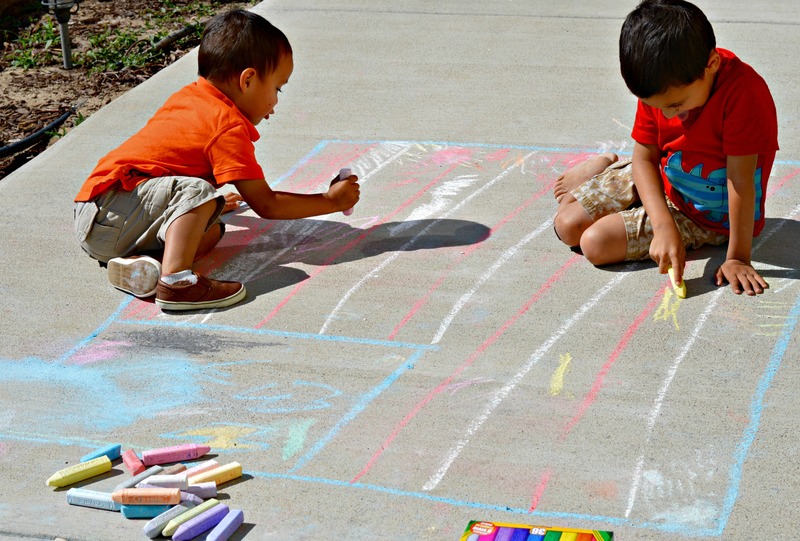 Another fun activity that we have planned is for the kids to be able to use this fun red, white, and blue colored chalk to draw their own fireworks and other images on our patio while the food is cooking and while we are waiting for the fireworks. Of course no BBQ will be complete without the food. Above I mentioned that the menu includes an all-American burger. For this burger, we start by making a delicious beef patty that uses 93/7 ground beef, minced garlic, paprika, salt, pepper, some breadcrumbs, a small amount of mayo, and liquid smoke. After the patties are formed, we will grill it before topping it with a slice of cheddar cheese, homemade onion strings, thick slices of bacon, and BBQ sauce, and served with a delicious bread and butter pickle on the side. For the buns you can really use anything, but I love having a nice soft roll to go with the delicious burger (we always like to grill them as well to get that nice crunch). The result is a delicious burger that everyone will love. How are you celebrating the 4th of July this year? Start by adding the beef to a large bowl. Add the rest of the ingredients, and mix by hand until everything is well combined. Flatten the beef to the desired thickness, and begin cutting out round pieces (I used a bowl to cut the patties out). After cutting each patty, roll the beef back up, flatten, and repeat. Wrap in plastic wrap and cook immediately, or freeze for at least an hour to make grilling easier. Grill to desired cook, and add cheese. Put the grilled patty on a grilled bun, then top with bacon, onion strings, BBQ sauce, pickle, and anything else. Clean and peel the onion, and then cut into very thin slices. Add the onion slices to a large bowl and cover with buttermilk, let sit for 20-30 minutes. In a separate bowl, combine the flour and all of the seasonings. Heat the oil until hot enough to fry to the onion strings. Take some of the onion strings from the buttermilk and add to the flour mixture, and then immediately to the fryer. Once golden brown, remove to a bowl lined with a paper towel and continue until all of the onions are cooked.